The first thing you should do when making this recipe is preheat your oven to 375°. Then chop your veggies (except for the peas--you won't add those until you are putting together the pie and adding the gravy). You can use a deep dish pie plate, but I just used an 8-inch square baking dish. Toss the veggies in the dish with the 4T of olive oil and salt and pepper to taste. Roast them in the oven for 30-45 minutes, taking them out and stirring them every 10 minutes. They will be tender and browned when done. 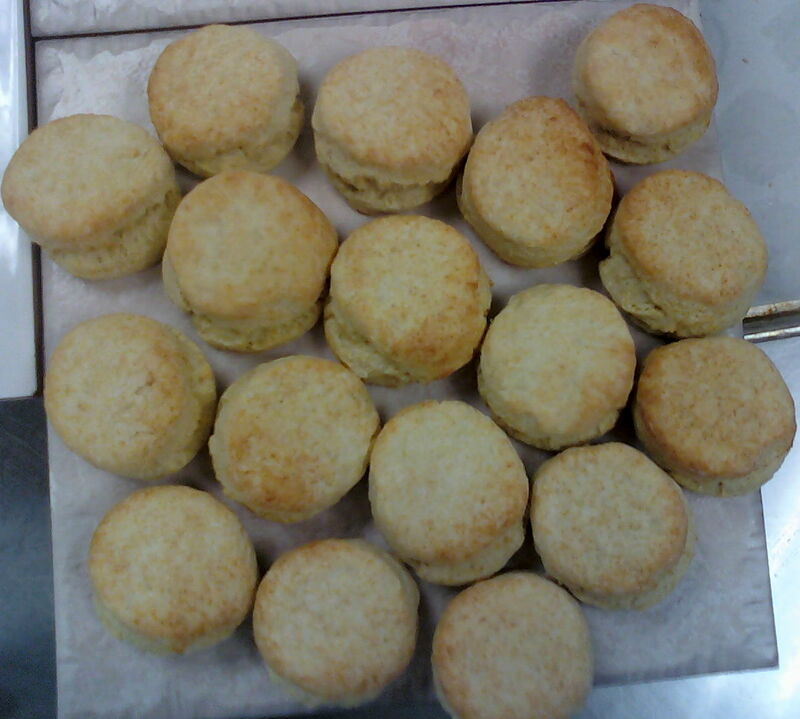 While they are happily roasting away, start your biscuits. Sift together the dry ingredients (or if you are using pre-sifted flour, just whisk them together). In a small, separate bowl, mix together the sweet potato, buttermilk, and honey. This will keep the sweet potato from clumping and make it easier to add to the flour mixture later. Set it aside. 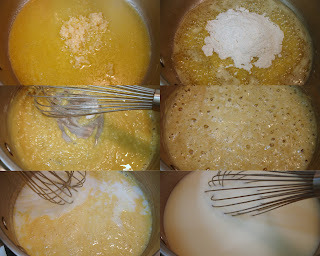 With the biscuit method, you add all the dry ingredients, cut in the fat, and then add the liquid ingredients. That's it! So now you have to "cut in" the butter. Make sure the butter is cold, not warm, not at all softened. Cube the butter and toss it into the flour mix. 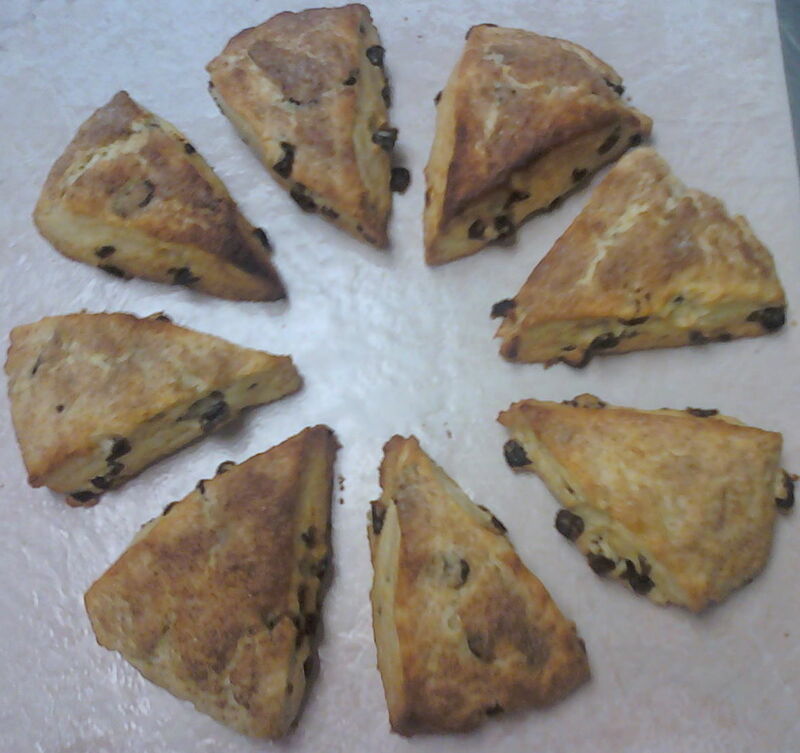 Now, if you were to just start cutting it in with a pastry cutter, etc. there would be no point to the cubing. You wind up with a lump of butter. SO, toss the butter cubes in the flour to coat each one and make sure it keeps its hands to itself and away from its buddies. Now for the new techniques I learned in class. My grandma always used a fork or pastry cutter (in the later years) to cut in the butter, but my pastry chef showed us a method that works amazingly well. Unfortunately, it's easier to show and explain in person, but I'll give it a shot here. :) Pick up a bit of flour and a cube of butter in one hand and smoosh the flour across the butter cube. Don't push the flour into the cube, but flatten the cube a bit while rubbing the flour across it. Make sense? Now make a well in the center of your dry ingredients and add the sweet potato/buttermilk/honey mixture. About the buttermilk...it makes a HUGE difference. My Bubba doesn't even like biscuits without buttermilk now. Here's another chef technique: use a fork to toss together the two mixtures. 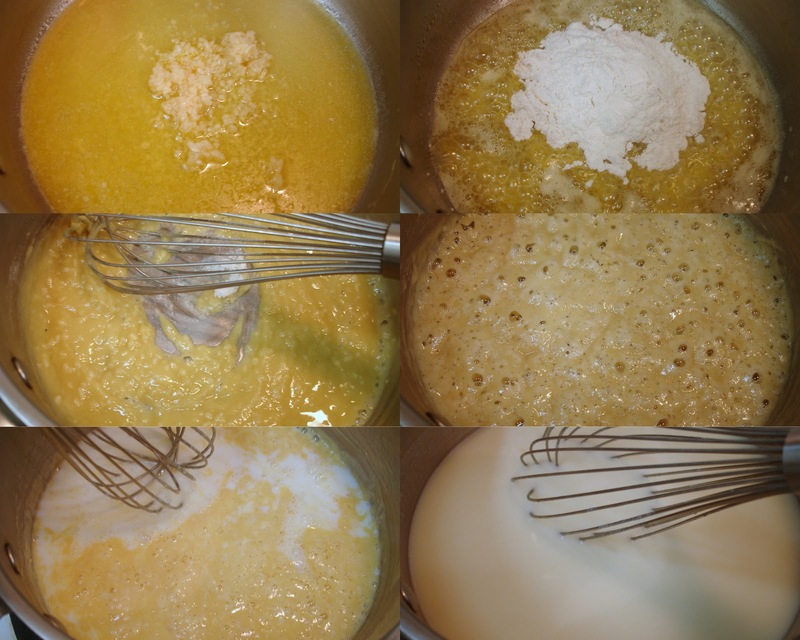 Sweep the leg fork along the sides of the bowl, tossing the dry into the wet and gradually folding/mixing lightly. While the dough is chilling, start making the roux for the gravy. Melt the 6T of butter in a pan and then add the garlic. Saute for 2 minutes and then add the flour. If you are using a light butter or Smart Balance (non spread/tub) stick, you may need to add more flour because of the higher water content. I added about 2 more tablespoons of flour. You want it to be thick like peanut butter (says my Thursday non-baking chef). Salt and pepper it! Cook for 2 minutes until it picks up a bit of color. Now slowly add the milk and chicken broth. Okay, here's a neat trick to make chicken broth a bit more flavorful if you are using store bought (which you probably are). Buy the 32 ounce carton and boil it vigorously until you are left with three cups. You are reducing it and it makes for a richer product. Taste, taste, taste, taste, taste your gravy while it cooks. Add salt and pepper, garlic salt, whatever you like to season it but SEASON AND TASTE often. Your roasted veggies will be done by now. Take them out of the oven and spread the chicken on top of them. This is when you will add the frozen peas if you don't forget them. Which I did. When your gravy is done, pour it on top of your vegetables and chicken. Oh, yum. This gravy is soooo amazing. 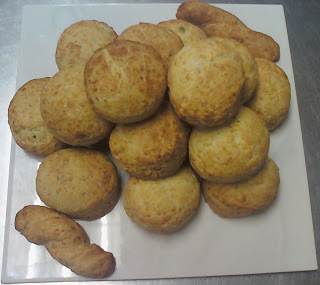 Now it's time to add the biscuits. You can lightly roll out the dough and then place it all at once on top of the pot pie OR add the dough by drops and smooth it out over the pot pie. Doesn't matter. I dropped it on and spread it out. Then paint it with the egg wash.
Sooooo good. So flavorful! The amazing gravy, the roasted vegetables, the sweet potatoes and buttermilk in the biscuits!! You definitely don't need a side with this meal! You have chicken, vegetables, and most importantly (at least to me and the Goose) the bread. YUM doesn't do it justice. Make this pot pie soon! Or just make the biscuits because they are divine. The sweet potato mash adds a whole layer of flavor to already delicious buttermilk biscuits. Well, it turns out going back to school after 14 years of being a stay-at-home mom is tougher than I expected. I am having some time management issues, and am slowly working through them. My whole schedule had to be thrown out the window and reworked, but after 14 years, I am finding it a little hard to adapt to the new one. There have been tears. And missed appointments. And even one, "why didn't the Goose come home on the bus?!" Oh, right, she told me about that French Club meeting last week and I need to go pick her up--right now. I am finding meal preparation a bit harder, too. Thursday is particularly difficult because I am not home for dinner and have to plan something and write it down for the girls to cook. They have been a huge success at it and are even enjoying it. It's a little nerve-wracking for me since they have to start dinner before Bubba gets home and no one is here to help them if they need it, but we've talked about safety and, so far, I haven't had them make anything in the oven that Bubba isn't home to pull out. On top of all of us trying to get used to my new schedule, we have had a very trying month. Too many things to detail completely, but Bear got sick and we were sure we were going to have to put him down (he's fine now), we had a health worry with Tink (she's fine now, too), several minor issues that feel HUGE when you are already feeling overwhelmed, and worst of all, our beloved Smores died. She had been sick for a while, and finally passed away yesterday. We think she was egg bound. We did everything we possibly could for her and even gave her a round of antibiotics (I know, not organic, but her life was on the line). We kept her alive for as long as possible, without suffering, but she finally gave out. We will miss her so much. As far as culinary school goes, my classes are so much fun. SO MUCH FUN! I absolutely adore the chefs I am working with and the classes fly by because they are so great. Getting through everything else is easier when I think about the end goal. I am going to be a chef! And...I am finding myself getting very interested in food science. Very interested! I could even see myself being a food scientist. So, while September has been an extremely trying month for our family, we are looking forward to the coming holiday seasons. Halloween is my absolute, bar-none, favorite time of the year. Until it's over, and then Thanksgiving is my favorite...and then xmas. The baking!!!! I will try to post at least once a week, but bear with me. Time Management is not my friend...yet. We have a winner! I used random.org to generate the winning number, 10. "Susan said... How about trying some stuffed zucchini blossoms- i always see those on the 'fancy' food shows, they look interesting- it would be fun to try them out." I want to try EVERYTHING you all suggested!! Ratatouille, risotto, crab cakes, creme brulee, crab wellington, homemade pasta, pastry with fruit, Chipotle pork burgers, Cornish game hens, grilled chicken kebabs, Cajun Remoulade, coq au vin, osso bucco, or mini turkey burgers...my mouth is watering. I asked the Goose what she would like me to make and she said, "any of those fancy mac and cheese suggestions." :) Of course. She is taking French this year, so I love the idea of making Macaronis et Fromage. Thank you all so much for making my first giveaway such a big success! And thank you to CSN stores for their generous offer of a $50 gift card! !